Used for handling debris, brush, or orchard prunings, CTMG-48S is designed for sub-compact tractors that use universal skid steer quick attach system. Gripping notches in both upper grapple and lower rake help retain loose materials. While 31 in.Â wide single upper grapple is made of 3/8Â in.Â material, lower 48 in.Â wide rake has tines made from Â½ in.Â material. 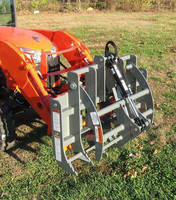 Worksaver, Inc. introduces a new mini grapple for sub-compact tractors for handling debris, brush or orchard prunings. The CTMG-48S grapple is designed for sub-compact tractors that use the “universal” skid steer quick attach system, allowing the operators to easily change from the bucket to the grapple. The 31” wide single upper grapple is made of 3/8” material while the lower 48” wide rake has tines made from ½” material. Both the upper grapple and lower rake feature gripping notches to help retain loose materials. Worksaver, Inc. is a manufacturer of agricultural, industrial, commercial and construction equipment for a variety of applications for property owners, farmers, ranchers, contractors and many others. A variety of equipment is able to fit skid steers and front loaders and tractors. For more information, contact Worksaver, Inc., P.O. Box 100, Litchfield, IL 62056-0100. Phone: 217-324-5973, Fax: 217-234-3356. Website: www.worksaver.com, E-mail: sales@worksaver.com. Strong-Arm™ Grapples come with load capacity of 50,000 lb.